Nowadays there are so many flavors of yoga its hard to keep them all straight! I’ve been dabbling in yoga for a year now, trying to find a flavor that suits my palate if you will, but have not been very successful in finding the right style or teacher for me. Some classes were too “hot”, some were too bendy, some were to fast, and some were incomprehensible and way over my head. 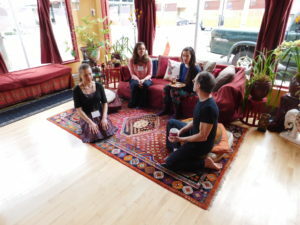 It took time but I finally found one that is just right: Release Yoga with Breana DePriest here at SomaSpace. Bre is so sweet, kind, authentic and strong in her style of yoga. She slows things down, doesn’t ask you to do more than what your body allows, reminds you to breathe, and encourages you to listen to what your body is telling you, where it needs a little more TLC. It’s the first yoga class I’ve been too that from the very start had no sense of competition, expectation, or rigidity. Bre is soft and open in her teaching style, allowing each student to move into the poses at their pace and to the degree that their bodies allow. She’s real, loving, funny and down-to-earth. Her class is all about releasing tension built up from the craziness of life and work, taking an hour out of our day to honor our bodies, focus on the present moment and just chill out. The poses are fluid and varied but never too much or too hard. And if they are too much for someone, she reminds us that we have permission to not do them, that we are in control of our bodies. 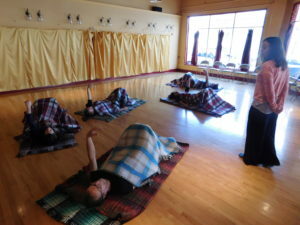 But beyond the yoga, my favorite part of Bre’s class is her visualization at the end during shavasana. Bre’s visualizations are THE BEST! Her soft, flowing voice coos the soul into a place of peace as we imagine ourselves floating in a warm sea under the stars being held by the water or as a seed planted way deep into the earth, being nurtured by the soil and growing into a strong healthy plant bathing in the sun. It’s a magical end to a wonderful movement practice that leaves you feeling peaceful, rested, rejuvenated, and full of gratitude. And it’s all donation-based. Bre does this from her heart. So if you check it out and like her style, slip her a few bucks. 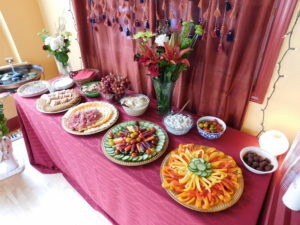 March Open House ~ Thank you! 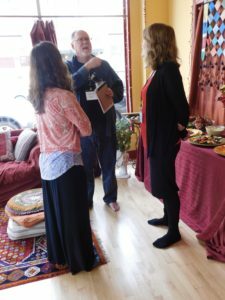 Thank you to all who attended our Spring Open House on March 21, 2017! It was a great success and we’re so grateful you decided to share your Sunday with us! 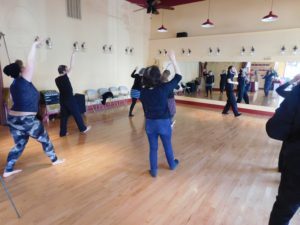 We hope you enjoyed our mini-classes and that you are inspired to join us for any number of our wonderful class and event offerings. 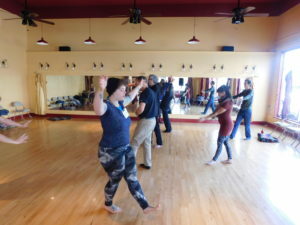 Check out all of our class and event offerings! 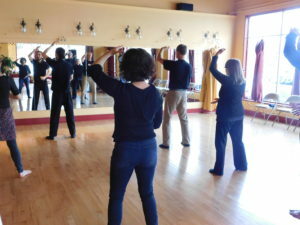 Qigong. That’s what they are doing. And it’s magical. When Ben Rosen joined that teaching faculty here at SomaSpace, it was the universe’s way of telling me “Stop judging it and try it out. You may learn something.” And so I tried it. And I fell in love with it. And you will too. 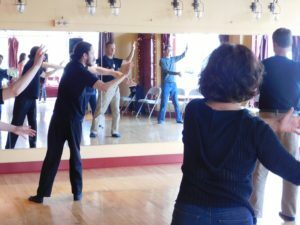 These slow, meditative movements in Ben’s Gift of the Tao Qigong are backed by honest intention and induce a natural confidence of their power. 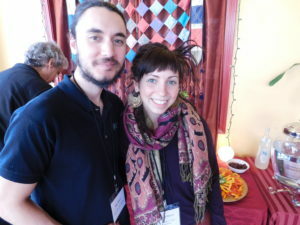 It’s bizarre really…but when I’m moving in the way Ben explains, keeping a soft awareness of my body’s center and an open mind that I am cultivating and moving qi energy, a calm washes over me. A calm that feels safe, natural, and peaceful – like I’m coming home to a state of being that is my birthright. After his one-hour class I feel high – no joke. It’s like this deep knowing that everything is just as it is meant to be and that worrying won’t do me any good. It’s glorious. 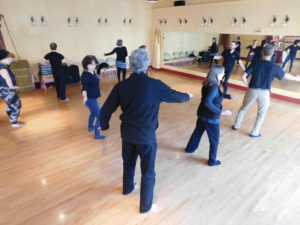 I’ve done yoga, meditation, Kirtan chanting, and a handful of other practices to cultivate mindfulness and presence awareness, but nothing has impacted me so profoundly and so quickly like Qigong. In all honesty, it’s hard to explain – you just have to try it. I did, and I now know why those older folks are moving in ridiculously slow ways in the park. They are taking care of themselves in a profound way. 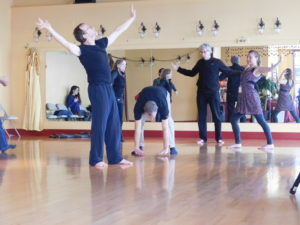 So next time you pass them by, don’t judge but give thanks – for the only way we will heal this world is if we heal ourselves first…and Ben’s Qigong is a beautiful place to start. 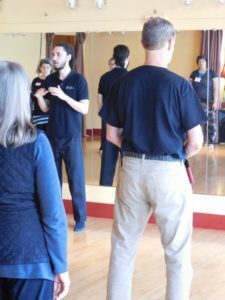 In addition to being a Qigong teacher, Ben is a Clinical Qigong practitioner here in Portland, trained by a one of the most respected clinical masters in the world of Qigong. I had the privilege of receiving a clinical session from Ben and went in not knowing what to expect. I came out with that same state of calm, but with the dial turned all the way up! 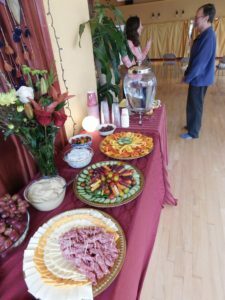 His intention, care, passion and respect for his energy healing modality were so present during the treatment it’s like they oozed out of his being into the room and into my body. Energy is a sacred living entity that needs to be nurtured and cared for, and Ben’s understanding of that truth is so clear and honest. His authenticity is inspiring. 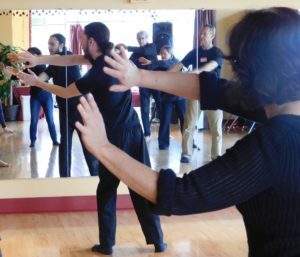 I highly recommend you attend Ben’s Gift of the Tao Qigong class at SomaSpace on Wednesday nights at 6pm-7pm (your first class is free!) and schedule a clinical Qigong appointment with him soon. Come with an open mind, open heart and present moment awareness and you will feel the magic. Tell him Sam sent you. Many people are having difficulty relaxing their nervous systems and returning to a parasympathetic (rest and digest) state. All the upheaval, violation of basic rights, and hate-crimes is heart breaking and throws many people into a sympathetic (fight, flight, or freeze) state. Once in fight-or-flight it can be difficult to get out. And yet getting out of fear, panic, and reactive survival mode is crucial to sustaining oneself and having the ability to be present, active, and grounded in integrity and good choices. It is also difficult to sleep, eat, and act when you are stuck in fight-flight-freeze mode. And I have heard many people struggling with these basic functions recently. These are tough, scary times!! Having tools to bring yourself back into rest-and-digest mode is essential for health and vitality. And the world needs you to be ready for action. So I am moved to offer Quieting Your Nervous System (part 2) on Tuesday, March 21st from 5:45pm-6:45pm. Part 2 will be a stand alone class, so come whether you attended part 1 or not. 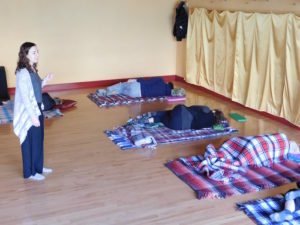 At my last free class, SomaSpace was filled with a diverse group of people who were looking for help quieting down and relaxing in their body, mind, and souls. 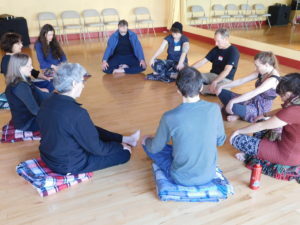 Through gentle breathing exercises, small rocking motions, and resting, they released more fully into the floor and their bodies expanded in movement, showing their muscles were letting go and their systems were registering the safety to relax and rejuvenate. If this need to quiet down and restore, to breathe more fully, to feel the ground beneath you in a fuller way resonates with you, please join me for Quieting the Nervous System, part 2. It’s a free class. A gift to you from me in these difficult times, when community is essential and self-care must be prioritized in order to endure and catalyze change. Bring your loved ones and share the gift of peace and quiet.